To deliver good nitrox and trimix, breathing gas quality and handling is important. We have Lenhardt and Wagner super silent compressor to deliver breathing gas that we use to make nitrox and trimix. Filters are changed according to the schedule. We pride ourselves in delivering good air quality. We can fill nitrox and trimix, and we have a huge bank with 300 bar air. We are rebreather friendly and we have RB bottles in the centre. 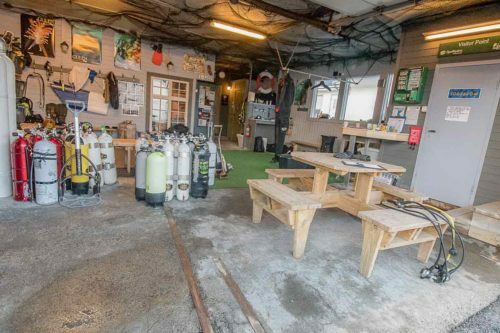 We also and provide an area where divers can do repairs. Our tanks are standard 15/200 steel tanks fitted with double valves to accommodate those having two first stages. There are also a number of twin sets and stage bottles available, but make sure you check the availability before you arrive. All our bottles are oxygen cleaned for use with Nitrox and Trimix. Also, we have a number of stages ready with kits for rent if you need during your vacation. At Gulen Dive Resort we use DIN valves as standard, but they can be fitted with an adapter if you have a yoke/INT regulator. If there is anything we can do to help you planning a trip, please let us know. If you need something that we do not have at the dive centre regularly, we will in most cases be able to hire for you to use while you are on vacation. Just send us an email with some information, we will replay to you shortly. On the following pages, you can read more about the dive boat, our compressor and blending facility, rental tanks and the dive resort in general.